Buzz Kill Ramblings of Tim Louie: COCKROACH MILK?.......NOT THANKS! I'm going to guess that my wife will not be reading this blog mainly because of the photo, but if she reads on, she will not be happy either. So, babe, don't read on. 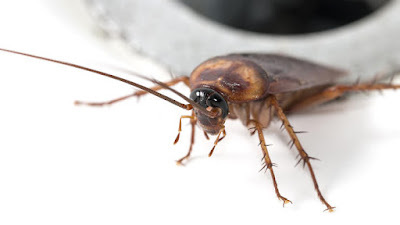 Anyway, we all know this disgusting critter as the cockroach, right? The scurry around kitchens feasting on scraps and whatnot. Well, a new research could see humans turning to cockroaches as a source of food. Yeah, no thanks! An international team of scientists have found that crystals found in the stomachs of a particular type of cockroach are a highly nutritious source of protein. I hope none of you are eating breakfast or lunch while reading this. The Pacific Beetle Cockroach is found in Asia and Pacific islands including Hawaii, and is the only known viviparous cockroach, which means it gives birth to live young, just like mammals do. Also like mammals, they have to feed their offspring with a "milk" containing protein crystals. According to the research conducted by scientists from India, Japan, Canada, the US and France, a single mile protein crystal from the cockroach's stomach is estimated to contain more than three times the amount of energy found in an equivalent amount of dairy milk. Also, their crystalline nature means the crystal releases protein at the same rate the protein is consumed. One researcher from India said, "It's time-released food! If you need food that is calorifically high, that is time released and food that it complete, that is it." Um, not to sound racist or ignorant, but aren't cockroaches a delicacy in India? Of course, he would say that. Another researcher from Australia went on to say that even the very idea of cockroach milk sounds "really out there," it has a lot of promise. He also said they wouldn't go and kill lots of cockroaches for it. They would isolate the gene for this protein from the cockroach and then express it and grow it up in a yeast system in very large microbiological vats and produce large quantities. The Aussie researcher continued by saying he was curious to see where this takes us. Yeah, I'm out! I mean why not kill a bunch cockroaches anyway. Who cares about their milk. I think we have enough protein on this earth to survive without drinking cockroach milk. Sorry, just not for me. Maybe for you?